Welcome to Gritsapaloozah 2013! This lovely little artistic rendering by hostess Beth Price was one of the first sights we saw upon arriving in Charleston. 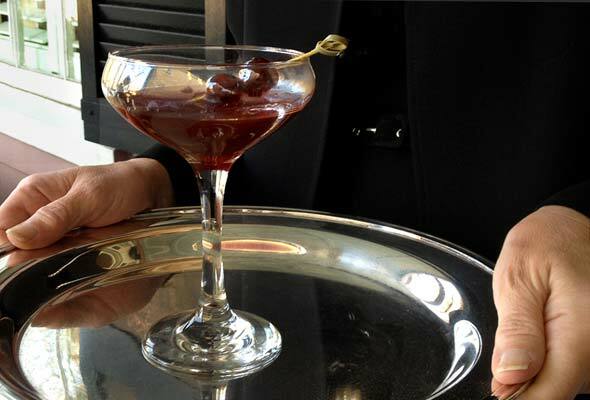 The Fatty Daddy Cocktail made its premiere in a regal retro coupe, much to the inflation of our own Fatty Daddy’s ego. We didn’t need ice breakers or trust games, not with such nice folks as recipe tester Marilee Johnson (right) and Jan Marlor, both from Georgia. 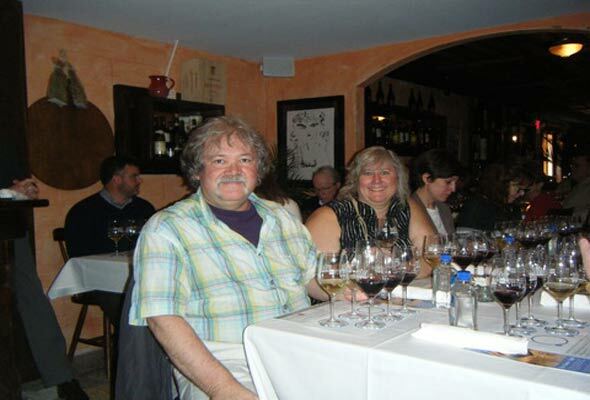 Veteran recipe tester and oenophile Dan Kraan and his wife, Jan, sit at rapt attention during a seminar on Old World wine varietals. 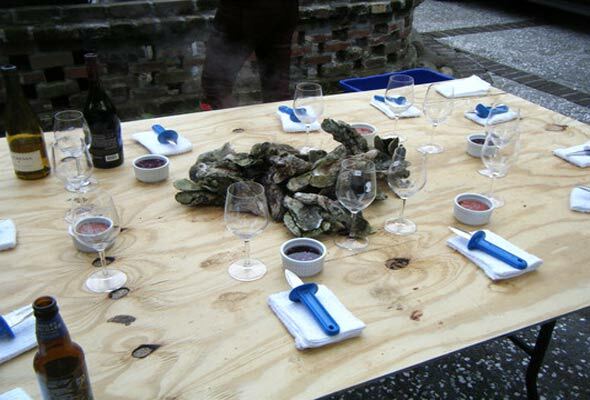 Come Friday evening, all dignity was cast aside as we rolled up our sleeves, shucked some oysters, doused them with mignonette, and slurped them down. Nothing like a little oyster muck under your nails and ample white wine in your glass to promote bonding amongst colleagues. 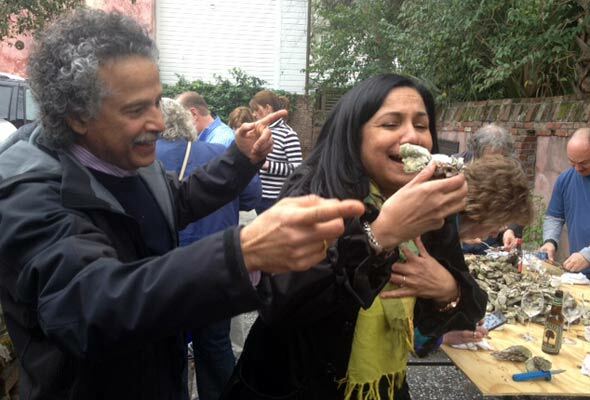 Tester Sita Krishnaswamy gets some moral support from her husband, Krish, before, during, and after downing an oyster. 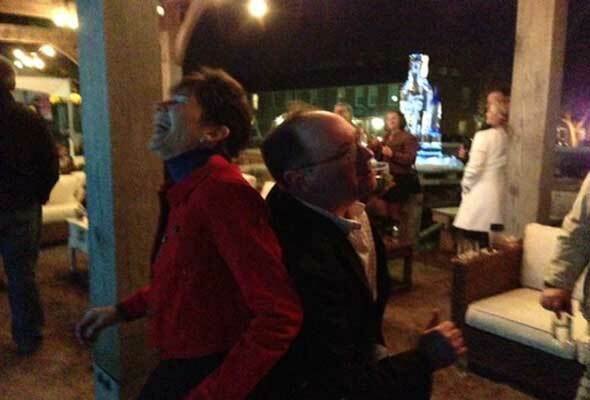 Friday saw several revelers dancing well into the night. Here, Clayton Price and Marilee Johnson get down. 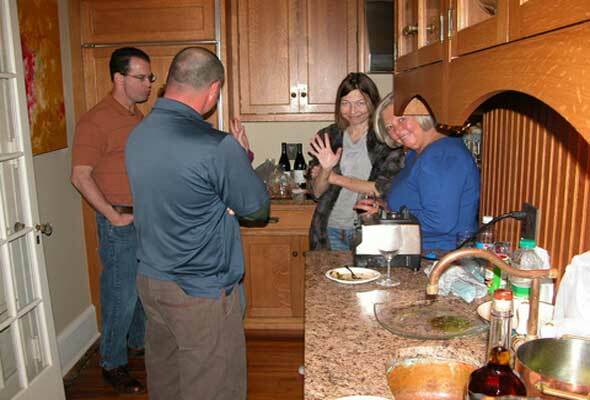 Too many cooks in the kitchen? Nah. 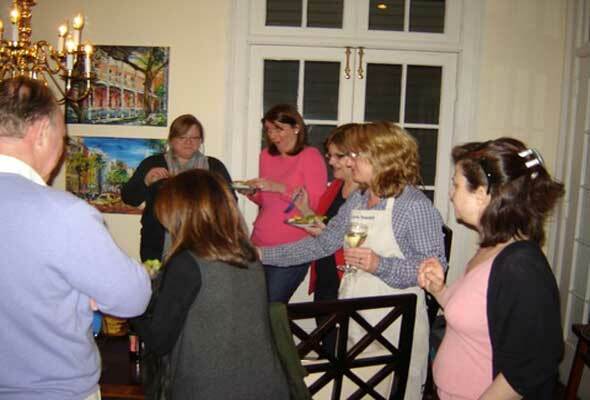 Creating a meal to remember are, front to back, Eydie Desser, Sita Krishnaswamy, Jackie Gorman, and Beth Price. Testers and fast friends Vicki Lionberger, left, and Sita Krishnaswamy, slipped out of the creative chaos in the kitchen for a spell. 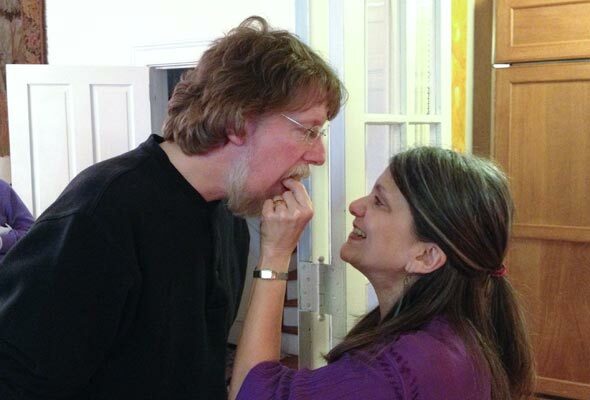 Husband-and-wife team Shawn and Jackie Gorman are accustomed to tasting and tweaking recipes together. "Honey...?" 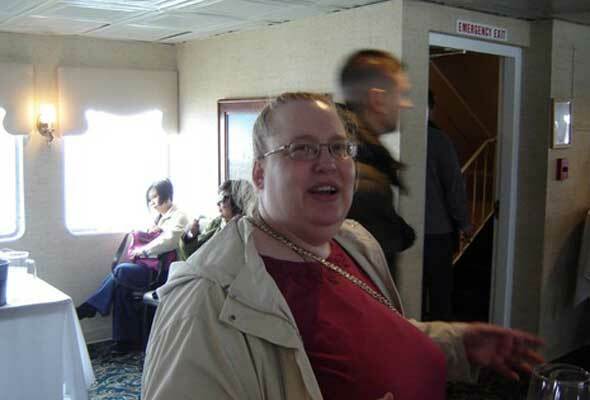 Jill Raison was one of many happy campers on the booze cruise, er, scenic cruise around Charleston’s waterways, complete with low country cuisine and local wines. 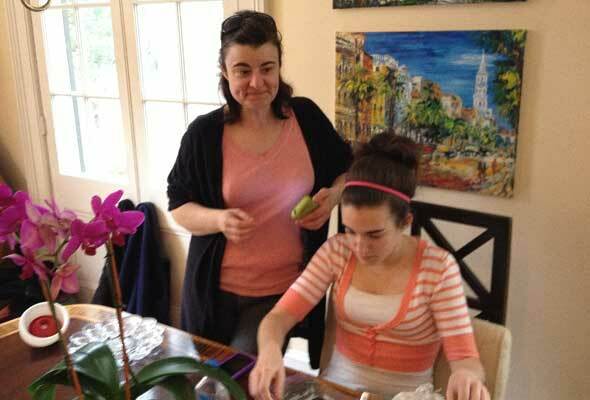 Sofia Reino, of Portugese descent just like our dear David, and her daughter, Rita, tend to last-minute preparations for Saturday's dinner. Like mother, like daughter. 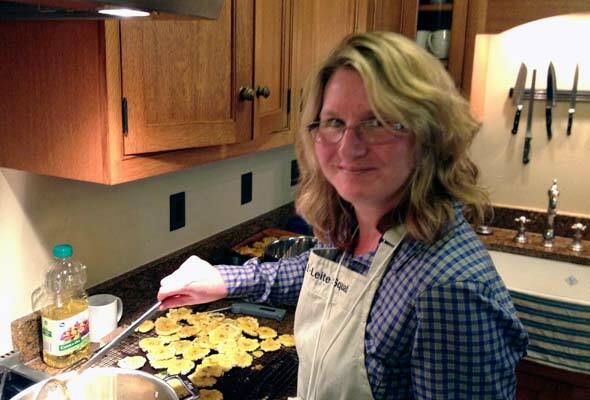 Tester Melissa Maedgen refused to step foot out of the kitchen Saturday in her efforts to wow everyone with her culinary dexterity. David welcomes pastry chef Jenni Field, who arrived just in time for dinner on Saturday, with a bear hug. 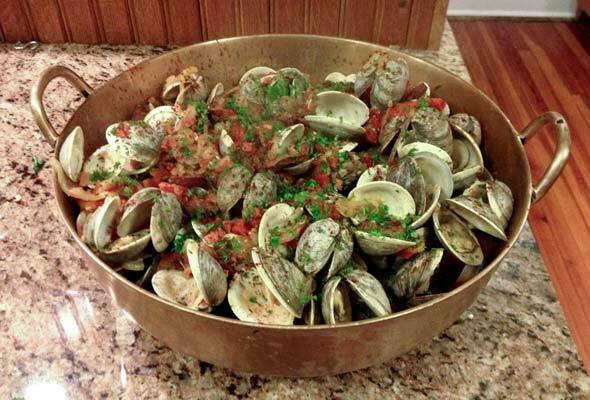 As a first course, David served up his famous Portuguese classic, clams and sausage in a cataplana—the recipe he demonstrated on the Today Show. A hushed silence, the first such moment all weekend, fell over Gritsapalooza goers as everyone dove into dinner. Tester Vicki Lionberger (right) and Editor-in-Chief Renee Schettler Rossi (center) lurk near the wine station and trade escapades from recent sojourns in France. Gritsapalooza commenced on a Thursday with a spectacular cocktail party thrown by Beth and her husband, Clayton. I’d granted her complete and utter amnesty with regard to the menu, stipulating she could do whatever she wanted so long as it constituted a classic Charleston spread. I needn’t have worried. 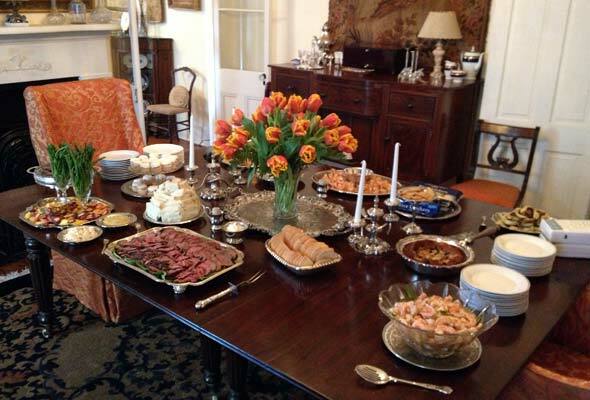 So classic, not to mention classy, was Beth’s menu—her dining table laden with silver platters piled precariously high with pickled shrimp, pimento cheese, benne wafers, roast beef, and tea sandwiches—that it attracted celebrities of all sorts, including the always charming doyenne of Southern cooking, Nathalie Dupree; cookbook author Rebecca Lang; food editor Kathleen Purvis; and that Bachelor Kitchen guy, Chris Hill, who never fails to charm the ladies. But what struck me more than the undeniable allure of the food, the celebrity crowd our soiree drew, or even the flat-out tipsiness induced by the Fatty Daddy cocktail (yes, the Prices even commissioned a cocktail to be created and named after moi; and yes, it was smashing in more ways than one) was the fact that I was finally standing face to face with people whom I’d worked with for several years but had only known online. That night I noticed things that endeared them to me in ways that just can’t happen virtually, not even on a video chat. The way some folks reach out and touch you on the shoulder as they laugh in commiseration at your most recent kitchen disaster. The way a special few can intuit when you need to be enveloped in an embrace. The way some folks never, ever let their eyes stray from yours when you’re talking, not even when someone passes by with a dessert tray of Lady Baltimore cupcakes. (I don’t think I’ll ever be able to offer anyone that kind of attention.) You know, that sort of thing. It wasn’t just me who seemed to have been charmed by pixie dust that night. Everyone else seemed to feel the same way, too. There was just something special—magical, almost, as Beth said—about the evening, from the very first moment when people we barely knew arrived to warm welcomes. There was Vicki and her husband, Norm Lionberger, from Kansas City. Linda Bernskoetter, also, coincidentally, from Kansas City. Sofia Reino and her daughter Rita from Milwaukee. Marilee Johnson and her equivalent of The One from Atlanta. Sita Krishnaswamy and her husband, Krish, all the way from New Brunswick. And more—so many more. It was nigh impossible to make my way back to the silver-laden table for more pickled shrimp—believe me, I tried—because the room was so crowded with LCers intently focused not just on noshing but on nurturing that Krazy Glue-like camaraderie that’d instantly sprung up. It was late, really late, when we all trundled out into the cold February night and stumbled back to our respective hotels and B&Bs, our voices, like the Waltons’ at bedtime, ringing out into the night. 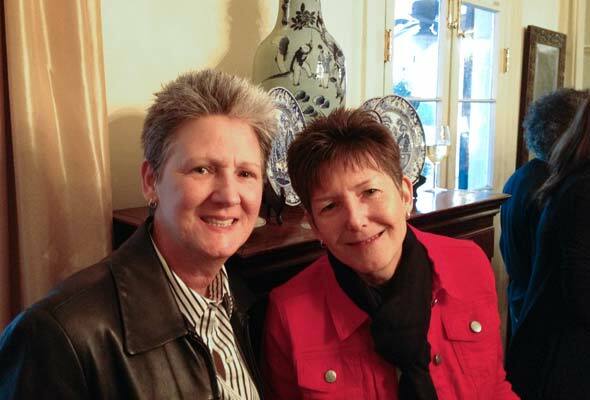 Afterward, people came and went from Beth and Clayton’s home, which we’d dubbed the Hospitality House, as they traipsed about town; attended various seminars at the Charleston Wine & Food Festival which was held that same weekend; and frolicked in Charleston’s many restaurants. Let me tell you, there’s no shortage of fine food in that city, particularly grits, pork belly, and shrimp. Especially shrimp. Pickled shrimp. Roasted shrimp. Shrimp salad. Shrimp and grits. Fried shrimp. I felt like Bubba Gump, I ate so much shrimp. And as you can imagine, quite a lot of time was spent swapping tales of menus and meals. Overall we had quite nice things to say about several places, including the Butcher & Bee, Charleston Grill, Toast, Eli’s Table, Slightly North of Broad (S.N.O.B. ), Amen Street Fish & Raw Bar, and the MacIntosh—but more on that later. 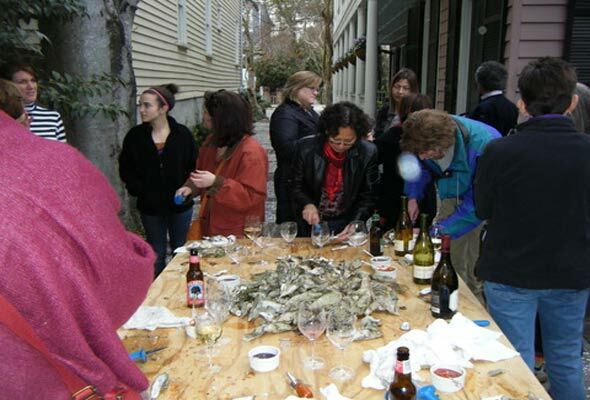 Foodwise, the highlight of Friday was the oyster roast held in the Prices’ driveway late that afternoon. We’d been instructed by Beth to not dress up but rather to come dressed as casually as possible. The One, who never hesitates to find reasons to don cashmere sweater, khaki pants, and shoes with a price tag higher than our national debt, thought her warning to be piffle and wore his Sunday best. He was certain a southern oyster roast was a civilized affair, with visions seemingly dancing in his head of slightly smoky, supremely briny, shucked oysters being passed by tuxedoed waiters. Only when he saw a plywood table set atop two sawhorses and a dozen or so oyster knives did he realize his error. Moments later, when Clayton dumped bucket after bucket of cluster oysters–imagine shellfish condominiums–from the grill onto the table, The One looked down at his clothes, back to the table, and then at me in all my blue-jean glory. To say I engaged in a little schadenfreude wouldn’t be inaccurate. Hah! That didn’t stop The One from presiding over a corner of the table for the entire duration of the roast, shucking oyster after oyster after oyster and slurping them down in greedy succession. (Oops, did I say greedy? I meant quick.) What he lacked in expertise he more than made up for in gusto, rivaled only by Shawn Gorman, husband and unofficial sous chef of LC recipe tester Jackie Gorman, who deftly and gracefully wielded his knife and his know-how, patiently stopping to offer anyone who asked a concise lesson in the art of shucking. Meanwhile, the rest of us mingled in the brisk afternoon air, getting muck all over ourselves, dipping oysters in red-wine mignonette or cocktail sauce, and sipping wine. And then Sunday. Our last day in Charleston. Already. The bunch of us straggled to the storied jazz brunch at High Cotton, where there was a live Dixieland band and apple-smoked bacon and White Lily biscuits and classic ambrosia and cheese grits and, yes, more shrimp. But what I remember more than anything else as everyone said goodbye was the tears. Lots and lots of tears and long embraces. And the induction of our youngest LC recipe tester, Rita Reino—or rather, honorary LC recipe tester, given what I understand about child-labor laws. And that was Gritsapalooza. I can’t speak for anyone else, but I swear I came home 10 pounds lighter, even though no one in the history of Charleston has ever left the city having lost weight. Yet it must be true, because I was walking on air for at least a week afterward. To witness firsthand all the relationships we’ve forged in the past 14 years come together in a single weekend of—get your hankies ready—loving humanity caught me unawares. It was only then, in Charleston, that I realized how truly blessed I am to be surrounded by the finest, most talented, and, thankfully, funniest people in the world. I can only wait for our next adventure. I read and had to reread this writing a few times to transport myself yet again there in Charleston and meeting the grand team LC is. Yet part of me was also teary as this was indeed a fantastic weekend in so many ways. 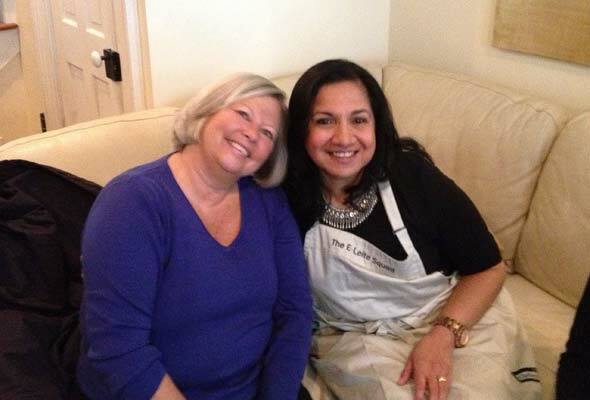 For me personally, it was of course meeting and interacting with you all, finally spending some quality time with my dear daughter, Rita, who is growing too fast and gaining new friends, and still remembering all the tears of laughter with the other mom-daughter team of Susan and Mary. As we live in such a small world, I have since had the pleasure of having Mary and Susan’s Dad at our home where they enjoyed (I hope!) 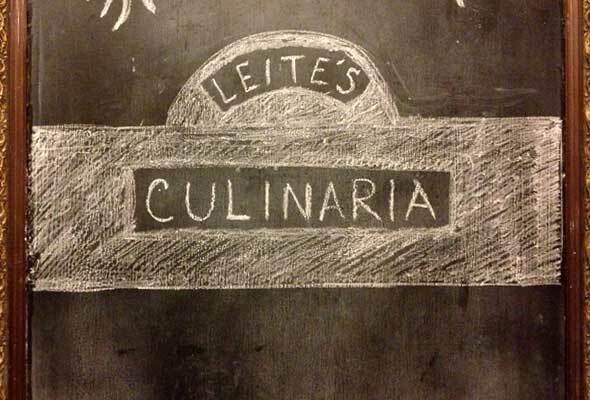 oddities from Portugal! Sofia R., now THAT’S the true wonder of what we do. You meet two women (whom you’ve only read about) through me (whom you’ve met for all of 30 minutes two years ago) at a party full of strangers, only to have two new dinner guests over to your home. Joyous. I’m with David on this one. That is magical! I need to send you pix of all of us cracking up around the brunch table, Sofia! Actually, send them to me, Jenni, so I can post them in your comment. Cannot wait to see those, Jenni. Can you believe now we always have the orange caramel in the fridge? Totally addicted! Pictures? I want to see! Such a wonderful time! Oh my goodness, David–sounds like I missed a lot, which is saying a Ton since The Beloved and I had The Best Time on Saturday and Sunday! Long live the Palooza! Well, I don’t want to make you feel bad, but you did! 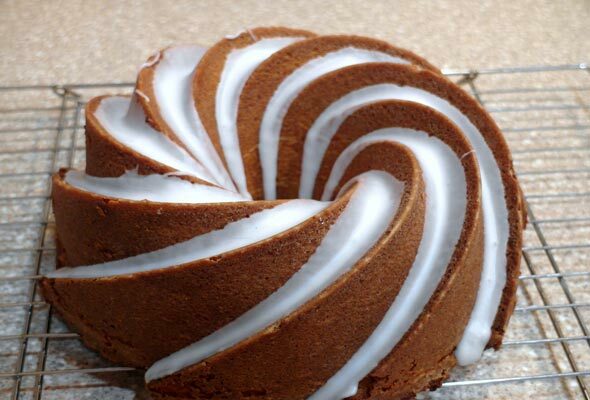 You, The Beloved, and your beloved cake certainly made a lasting impression on all of us. It was, Larry. Next time you must come. Sorry I missed this but thank you so much for writing such a great article about all the fun. It made me feel almost as if I were there. I could feel the love and fun coming through your words. Joan, we wish you were there, too. I can’t take all the credit, Renee and Beth were great cheerleaders and editors. They wanted to make sure we expressed as much love for, support of, and gratitude to our testers as possible. Pleeeeeeeze do the Barbecueapalooza here in KC. I’d love to show you & The One the town. Dorothy, it’s officially on the unofficial list! Ooooh, lobstahpalooza in Nova Scotia! Now that got my attention! And I dare say that gets my vote, too…. David, what a beautiful recount of our special, magical weekend! Thanks for all the detail. Like Sofia, I read and reread, wishing somehow we could relive it real time. But the wonderful memories will have to do. Thanks to you, Renee & Beth for all the hard work put into making it one of the BEST weekends of my life! 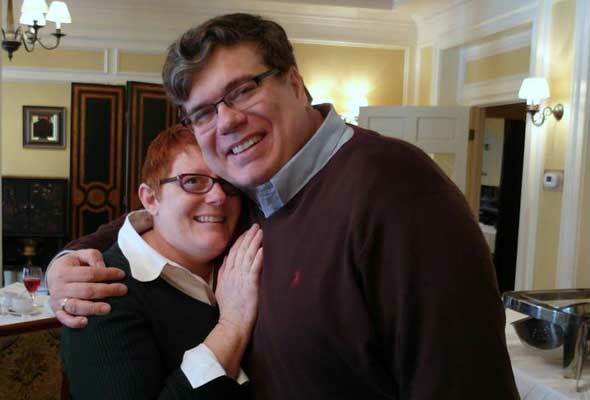 Marliee, thank you for being such a great tester–and a party-hardy partner! We did have a good time, didn’t we? I don’t think LC can wait two years for another get-together, do you? Well, I am experienced in the party department, what can I say? Yes, indeed, we had a great time! No, I can’t wait two years, so y’all just work on that. I’ll help any way I can! Yes, Marilee, you are certainly well versed in the party department! Sounds like everyone had a wonderful time, so sorry to have missed the fun and being able to meet all of you. I will say I am secretly hoping for a Seattlepalooza next. Great city and lots of food adventures to be discovered. Just to tempt you all think salmon, dungeness crab, halibut and lots of oysters. I’m no longer a part of your band of testers but your heartfelt post reminded me of what I liked best about it when I was–all of the wise, wonderful, as well as incredibly knowledgeable voices I came to know during that time! leduesorelle, even in you’re not a current tester, you’re still part of the family. And you were missed. I hope things have been going well for you since we last worked together.